The Roman-educated princess had inherited rulership of the Ostrogothic Kingdom, a successor state to the lately fallen Roman Empire, from its redoutable founder Theodoric. 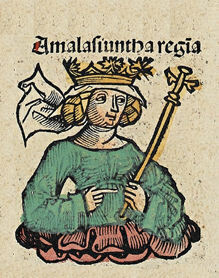 Technically the crown had passed to Amalasuntha’s 10-year-old kid; ruling as regent in a perilous situation, mom cultivated an alliance with the Byzantine emperor Justinian. Theodahad, upon receiving the supreme power, began to act in all things contrary to the hopes she had entertained and to the promises he had made. And after winning the adherence of the relatives of the Goths who had been slain by her — and they were both numerous and men of very high standing among the Goths — he suddenly put to death some of the connections of Amalasuntha and imprisoned her, the envoys not having as yet reached Byzantium. Now there is a certain lake in Tuscany called Vulsina, within which rises an island, exceedingly small but having a strong fortress upon it. There Theodatus confined Amalasuntha and kept her under guard. A Roman diplomat named Peter had already been dispatched by this time from the court of Constantinople to do some routine statecraft with the Goths, and he learned of the surprise reshuffling of power when he met Theodohad’s envoys on the road. Procopius says — or does he? — that Byzantium tried to twist the Goths’ shaggy arms in support of their matronly ally, but could not prevail against the vengeance of the deposed queen’s foes. When the Emperor Justinian heard these things, he formed the purpose of throwing the Goths and Theodahad into confusion; accordingly he wrote a letter to Amalasuntha, stating that he was eager to give her every possible support, and at the same time he directed Peter by no means to conceal this message, but to make it known to Theodatus himself and to all the Goths. … Now when Peter arrived in Italy, it so happened that Amalasuntha had been removed from among men. For the relatives of the Goths who had been slain by her came before Theodahad declaring that neither his life nor theirs was secure unless Amalasuntha should be put out of their way as quickly as possible. And as soon as he gave in to them, they went to the island and killed Amalasuntha, — an act which grieved exceedingly all the Italians and the Goths as well. For the woman had the strictest regard for every kind of virtue … Theodahad, such was his stupid folly, while still holding the slayers of Amalasuntha in honour and favour kept trying to persuade Peter and the emperor that this unholy deed had been committed by the Goths by no means with his approval, but decidedly against his will. The “stupid folly” helped to trigger Justinian’s war against the Goths, which resulted in Byzantium’s conquest of Italy and (temporary) reunification of the empire. It also led Amalasuntha’s son-in-law Vitiges to depose and murder Theodahad in his own turn: just another turn of the wheel among backstabbing aristocrats. At the time when Amalasuntha, desiring to leave the company of the Goths, decided to transform her life and to take the road to Byzantium, as has been stated in the previous narrative, Theodora, considering that the woman was of noble birth and a queen, and very comely to look upon and exceedingly quick at contriving ways and means for whatever she wanted, but feeling suspicious of her magnificent bearing and exceptionally virile manner, and at the same time fearing the fickleness of her husband Justinian, expressed her jealousy in no trivial way, but she schemed to lie in wait for the woman even unto her death. Straightway, then, she persuaded her husband to send Peter, unaccompanied by others, to be his ambassador to Italy. And as he was setting out, the Emperor gave him such instructions as have been set forth in the appropriate passage, where, however, it was impossible for me, through fear of the Empress, to reveal the truth of what took place. She herself, however, gave him one command only, namely, to put the woman out of the world as quickly as possible, causing the man to be carried away by the hope of great rewards if he should execute her commands. So as soon as he arrived in Italy — and indeed man’s nature knows not how to proceed in a hesitant, shrinking way to a foul murder when some office, perhaps, or a large sum of money is to be hoped for — he persuaded Theodahad, by what kind of exhortation I do not know, to destroy Amalasuntha. And as a reward for this he attained the rank of Magister, and acquired great power and a hatred surpassed by none. * The allusion to April 30 comes from Procopius but is ambiguously presented. When it comes to the age of antiquity, however, we’re typically grateful to get any date whatever.